Oak Park Heights was platted in 1938 and incorporated as a city in 1959, but its story began much earlier, when it was known as Oak Park. The first 10-block plat—entered by John Parker, William Dorr, Gold and Mary Curtis, Olive Anderson, and William M. McCluer in 1857—was soon followed by four more plats. Located in Baytown Township, between Stillwater and South Stillwater (Bayport), the new townsite had high prospects for sale of residential lots and, because of its river frontage, for industrial development. Most of the community founders had an interest in the lumbering industry. Early settlers were David Cover, a river pilot who came to Oak Park in the 1840s and dealt in logs and lumber, and John Parker, who relocated from St. Croix Falls in 1850. Early development centered around Mill Street, which led to the river and the milling townsites just to the south. 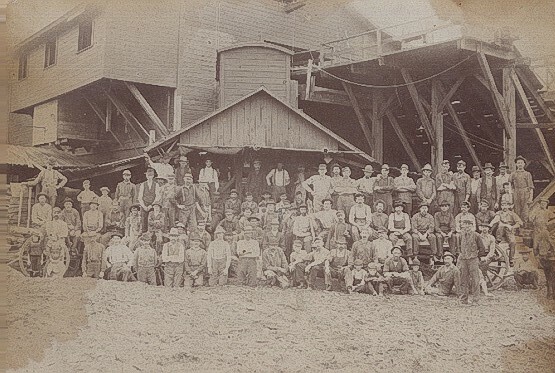 In the 1880s, a sawmill was constructed along Oak Park’s riverfront, along with a barrel-making company. About 1890 Jewish settlers Moritz and Bertha Bergstein settled in Oak Park. They operated a waste materials yard with a warehouse and “shoddy” mill, where waste fabric was recycled into stuffing for mattresses. The rubble stone mill building and warehouse still stand but are in the path of the new bridge construction, and are slated to be moved. Oak Park’s nearness to Stillwater and the main road to St. Paul encouraged a number of well-to-do residents to build impressive homes on the bluff overlooking Lake St. Croix. Still, only a few hundred people called it home in 1910. By 1914 the new Minnesota State Prison had been built next to Oak Park, bringing new economic activity to the area, but there was little new construction in the 1920s and 1930s. Oak Park, today known as Oak Park Heights, has been considerably changed by recent development. Highway 36 was cut through in the 1930s, dividing the community. Improvements to Highways 36 and 95 and construction of the Allen S. King generating plant and its power lines in the 1970s had considerable impact on the residential community. In the late 1990s, a portion of the original townsite including many of the mid-19th-century bluff homes was razed in preparation for a new river bridge. When Highway 36 was extended to Stillwater in the 1930s, automobile tourists flocked to the river valley. One old vestige of this era is the Club Tara Hideaway. This log cabin style roadhouse, built in 1932 as Lynch’s Chicken Shack and still in business as a restaurant today, is typical of the establishments that sprang up to cater to motorists. Another artifact of the automobile culture is the limestone wayside overlook on Lookout Trail, constructed in 1938s by the National Youth Administration. Both are on the original alignment of Highway 36. Little commercial or residential growth occurred in Oak Park Heights until 1960 when construction started on the St. Croix Mall. Oak Park Heights has become highly commercial, at least along the Highway 36 corridor, which features dozens of businesses and eating places. Considerable development has taken place on the south side of the highway, extending past Highway 5. Krueger’s Christmas Tree Farm has been replaced with big box stores, restaurants, apartments, and two large malls. Stillwater Motors, the Post Office distribution center, the Stillwater Area High School, and Boutwells Landing Senior Living Center are also in Oak Park Heights. The Minnesota Correctional Facility–Oak Park Heights on Orleans Street opened in 1982 as a maximum security prison. The community has numerous parks, including Brekke Park, which overlooks the large Bayport Wildlife Management Area. Although sometimes overshadowed by its neighbors, this growing community of more than 4,000 residents is still thriving. Oak Park was replatted in 1938 as the village of Oak Park Heights and incorporated in 1959. Its growth has sped up, adding more than 1,000 residents since 1990, to about 4,795 in 2014.